Bang! The Bert Berns Story is strong. The Music is GR8! The Story compelling. It’s based on the book Here Comes The Night. As someone who remembers this era, the songs in the movie were the soundtrack of our lives. For one man to make such a large contribution to my soul in such a short time is truly remarkable. The movie made me realize how radio and jukeboxes (the new technology) were responsible for my early music upbringing. Plus I thought of how much money I spent on jukeboxes that never made its way to Bert. There is much to enjoy and think about in this film. Please help me repay my cultural debt to a great record man and extraordinary songwriter. GO TO SEE THIS FILM. 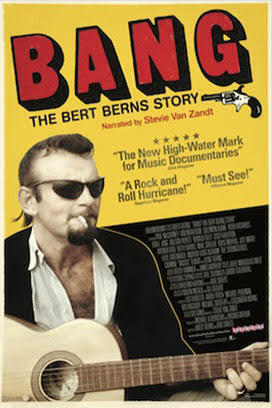 There will never be another Bert Berns.